Delicious food does not have to be difficult to prepare or require hours slaving away in the kitchen. Some of my favorite foods are simple with just a few good ingredients that shine together. The classic goat cheese rolled in herbs is one of those simple appetizers that is hard to resist with slice baguette and seasonal roasted tomatoes. You can make the full recipe to serve four or more or halve the recipe to make a delicious appetizer for two. I just walk out to the herb garden and snip off whatever is in season to make this, and this time I had fresh parsley, chives, and lemon thyme to chop and coat the soft tangy cheese. Fresh cilantro, basil, lemon basil, and marjoram are also good choices. Rolling the cheese in some good olive oil helps the herbs to stick. This simple appetizer is my contribution to Grow Your Own, the blogging event that celebrates the dishes we create from foods we’ve grown, raised, foraged, or hunted ourselves. I am the host for this round, and you can send your posts to me at andreasrecipesgyo AT gmail DOT com. Posts are due July 15. If you are new to the event, you can read more about the rules for participating at the Grow Your Own page. I hope you will join us! Makes 1 (8-ounce/227 g) log. Serves 4 to 6. Drizzle the olive onto the plate and roll the goat cheese in it. 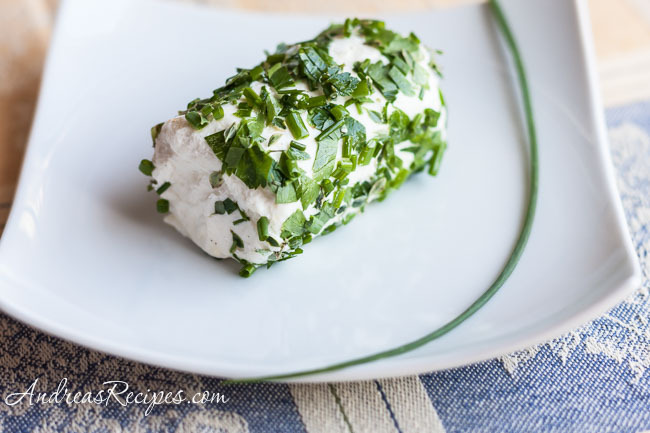 Sprinkle the chopped herbs on a piece of plastic wrap and roll the goat cheese in the herbs until it is completely coated. Wrap the goat cheese and chill until ready to serve. Serve with sliced baguette or thin wheat crackers. Looks lovely! You’re so right. Sometimes the simplest preparations are the most delicious! Yum, I love fresh herbs. They make everything so magical.